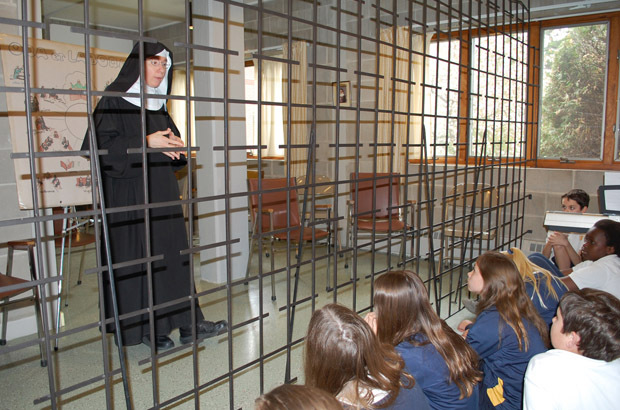 WESTFIELD, Vt. (CNS) — The joy of youth met the joy of consecrated religious life when sixth-graders from St. Francis Xavier School in Winooski visited the Benedictine nuns of the Monastery of the Immaculate Heart of Mary in Westfield. At first it was difficult for Chris Prim, 11, to work on the rosaries. “I could barely get the string wrapped around, but once I got the hang of it, it was really, really easy,” he said. Their work entails the work of the mind — spiritual reading — and the work of their hands; their manual labor includes cooking, housekeeping, gardening and canning, hosting guests for quiet and reflection and making altar bread for use in churches throughout the United States and in Canada. The nuns enjoy one or two half-hours of recreation a day that includes talking, walking outside, playing games and even tobogganing in the winter. “We do everything a family would because we are a family of sisters,” Sister Benedict said. Zack Roy, 12, appreciated hearing the Latin used during Mass and learning about the nuns’ way of life.